What type of tool do I need for this screw with a pin in the slot? What type of tool do I need for this screw holding my license plate? This is secure hex bit or similar. There are a bunch of varieties. The basic idea is to take a "normal" head (e.g., a standard hex or Torx) and add something to prevent the regular bits from working. It is of limited use as far as real security because the bits are usually not hard to find. For example, this set from Harbor Freight or this set from Home Depot. Search for "security bit" or "tamper proof bit" or similar. If license plate theft isn't a concern where you are, simply break out that pin. Use a needle-nose plier, small flat screwdriver, or something similar and bend it back and forth a couple times. It'll fatigue and fall off, and you can use a standard allen key. You need a TX Torx bit or screwdriver Ordinary torx bits are numbered T10, T20 T30 Etc. However you need the TX as in TX10 Tx20 Tx30 You can usually buy them all as one set. Not the answer you're looking for? Browse other questions tagged screws or ask your own question. What screwdriver do I need for this 'star' shaped fitting? Is there a special type of screw to hang a light fixture onto the ceiling? 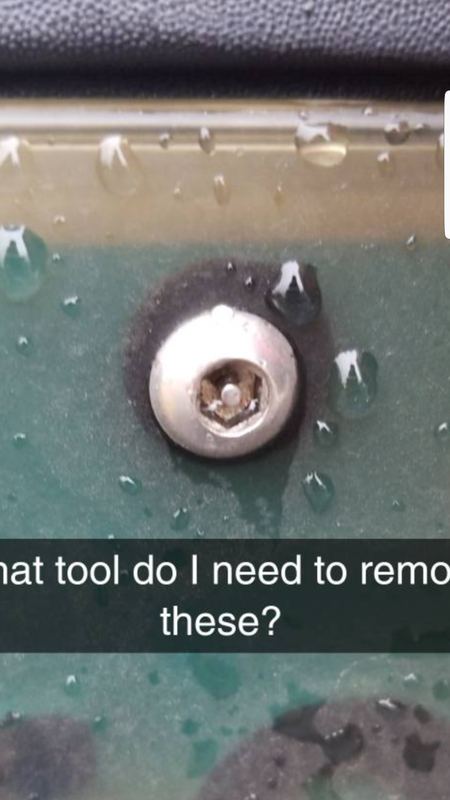 What type of tool do I need to remove this screw? What tool works with this star-shaped screw with a post in the middle?